If you see a mouse in or around your house it is probably the common house mouse, and you probably have something it needs for survival, such as food and shelter. These fellow mammals particularly relish seeds, grains, and nuts. House mice vary in size from 3 to 6 inches with grayish-brown fur, pointed ears, and naked tails. They make 1/8-inch gnaw marks and 1/8-inch rod-shaped droppings, and may make scratching noises in walls or attics. Frequently they travel along the same routes between their nest and food. You can sometimes see their smudgy trail on woodwork. 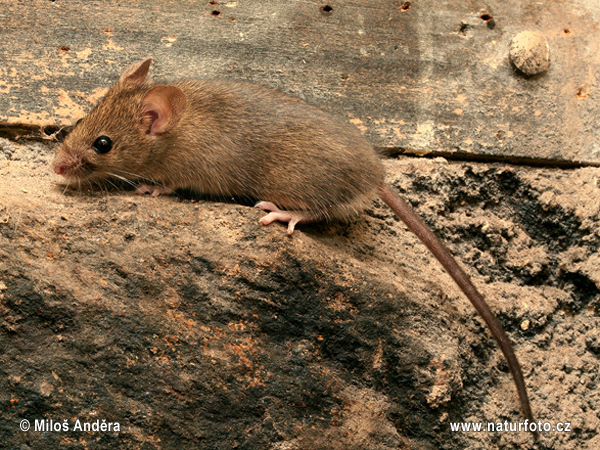 The dominant male mice are nocturnal; the less dominant males may have to forage during the day. Mice need only a tiny amount of food to survive and can live for a while without access to fresh water. Their nests are skillfully woven from shredded fibrous material such as cloth, paper, or dried grasses. A mouse’s life is a dangerous one. In addition to being unwelcome in homes, mice are an important part of the food chain for owls, hawks, coyotes, and many more predators. Glue traps are one of most inhumane traps ever invented. Some critters chew off their limbs when attempting to free themselves. Glue traps and sticky substances intended to cause mice to stick to them when they touch or walk on the substance are inhumane products and should never be used. Other wildlife and even companion animals may become stuck and suffer severely in glue traps and sticky substances. Rodenticides (poisons) should never be set out. They cause prolonged suffering from internal hemorrhaging and can also poison other wildlife, children, and pets. Animals, including pets, who eat poisoned mice can be poisoned themselves. Poisoned mice who die within walls, attics, and under floors can create foul odors in inaccessible areas. Snap traps are cruel and unnecessary. There are much better and more lasting ways to discourage mice. Mice can squeeze through holes the size of a dime. Plug holes with steel wool or cover them with 1/4” hardware cloth. Look for holes around drainpipes and wires that lead into the house, where house siding has deteriorated, and where the foundation is cracked. Check for holes from ground level to the roof, if possible. Aerosol foam or caulking can be applied over steel wool to strengthen it. Seal openings under and behind appliances with latex caulking. Place cotton balls soaked with peppermint oil or smelly used cat litter at openings to the house as temporary deterrents until you permanently seal entrance holes to your house. Mice are sensitive to smells and particularly dislike peppermint. Saturate cotton balls with peppermint oil available at pharmacies and some food markets. Place the balls on paths used by mice or where you see evidence of mice. You can also fill a small spray bottle with 1/4 cup of water and 40 drops of peppermint oil. Shake the bottle and spray contents along baseboards and inside cabinets along their rear edges. Keep bird-feeding areas clean of spilled seed. Spilled seed from bird feeders attracts mice, rats, birds of prey (who find it a convenient place for snatching a distracted, feeding bird or rodent), and other wildlife. It is better for wild birds and the ecosystem to provide birdbaths rather than bird feeders. Birds need fresh water for bathing and drinking all year long, and birds will be attracted to the water, especially if the birdbath is kept clean and the water is refreshed daily. Feed pets indoors and store uneaten pet food in the refrigerator. Sweep up crumbs and spills promptly. Store all food in mice-proof metal or glass containers. “Food” includes birdseed, pet food, garbage of all kinds, and compost. Mice can gnaw through plastic garbage cans, plastic pipes, and wood. Line compost bins with 1/4” hardware cloth. Eliminate nesting places by reducing clutter indoors, removing debris piles and discarded appliances, and moving firewood and vehicles away from the house. Keep a foot-wide gravel border around the outside foundation of the house. These measures will also reduce the number of places for mice to store their food. Clean up the paths, food storage areas, and nesting areas of mice. Then wipe the surfaces with disinfectant. Throw out any food that mice have touched. There are humane live-traps for mice available from humane societies, pet stores, and hardware stores that capture mice unharmed. Do not release captured mice in an unfamiliar area. Releasing mice outdoors near a woodpile provides a place where they can transition to living outdoors. Make sure that all access holes they used to enter the house are sealed shut. After you have sealed their access holes you may need to set one or more humane traps for several days in order to capture any mice that might have been trapped in the sealed house. Place the humane live-traps where you find evidence of mice, such as their droppings. Release outdoors any mice you trap that were sealed in. Most humane traps (such as Havahart traps) allow you to release the mice without touching them. Another easy way to catch mice humanely is to take a tall bucket, smear peanut butter in a ring inside the circumference of the bucket and set bricks or boxes in steps against the bucket so that mice can climb up and fall into the bucket. Place soft, folded towels on the bottom of the bucket where mice will fall. Secure a towel across the top of the bucket, and release the mice outdoors away from the house near a woodpile. IMPORTANT: Check any humane live trap that you set every few hours to prevent mice from suffering distress due to capture and lack of food. Ideally, set the live-trap during the day so that you can check the trap every few hours, rather than setting it at night. When handling and cleaning the live trap after it has held a mouse, wear rubber gloves, and clean the trap with a solution of 5% bleach and water.